Today we are thrilled to announce the release of Flipbooks 9.2. Our core focus for this release has been enhancing how your audience interacts with your content, specifically with a set of tools and features for publication text. While text search is a standard feature across all Flipbooks, highlighting words on the page is not. In Flipbooks 9.2 we’ve added support for result highlighting through our search feature. Results now get highlighted on each page and can be selected for further action such as saving for notes, copying etc. The highlighter tool is exactly what it sounds like! 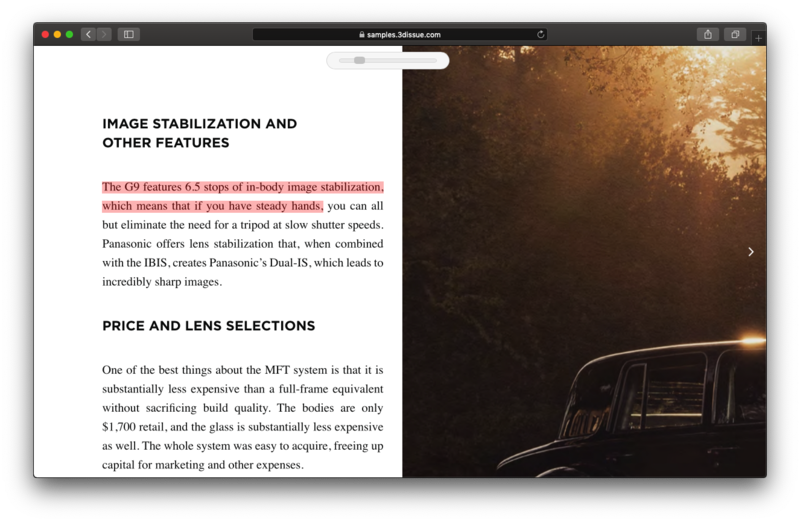 It allows readers to highlight text on pages. The highlight tool also enables searching for other occurrences of the highlighted text in your Flipbook. We’re also delighted to say that Notes have made it back to Flipbooks along with the highlight tool. You can now attach notes directly to highlighted areas from Desktop & Mobile. Highlighted areas can also be copied to your device clipboard and can be shared. This is configurable of course to allow for content protection. Why has Flipbook text selection taken so long? Simply put, technologies needed to catch up in order to provide a good experience. Because Flipbook pages need to replicate the source material properly their content is not “seen” as text by your browser. So we need to record all of the page contents and how it appears in your print publication, then add this information to each page as it is read. This makes up a lot of information, which a few years ago would have been too much for the average Mobile device. Thankfully times have changed! And we’re able to bring these features without any cost to user experience. Text selection and Notes on mobile have been some of our most requested features over the years and we’re really looking forward to hearing feedback on these features and any other features that are on your wish list. Check out our new features in our sample here or watch the demo video here.